Subaru has been in the SUV market in Australia for more years – no, make that more decades – than its competitors care to reflect upon. All Subarus (with the exception of the BRZ sportscar) have been sold only in AWD format since 1994 and the safety and superior roadholding added by driving all four wheels attracted many buyers. 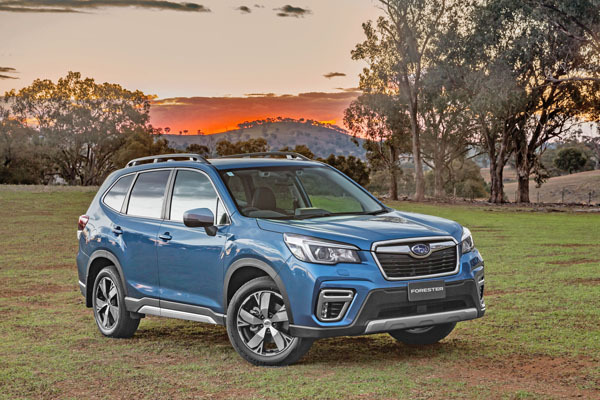 The second largest model in the range, the Forester was first sold Downunder 21 years ago and is selling its wheels off in today’s heated AWD / SUV market. To the extent that the gen-four Forester was the biggest selling model in Subaru’s range in 2017. Not content to rest on its laurels, the company has just introduced its fifth generation Forester. It is larger in all dimensions: 15 mm longer (at 4,625 mm), 20 mm wider (1815 mm) and has a 30 mm greater wheelbase, at 2770 mm. New Forester has ground clearance that almost puts it into the 4WD class, rather than SUV class: 220 millimetres of ground clearance 18.7 degree approach angle, 19.6 degree break-over angle and 24.6 degree departure angle. Styling is strong, with blunt angles that are reminiscent of the latest very-practical Volvo XC series. Forester’s cargo area design is therefore big and easy to load. Compared to the superseded Forester the floor width of 1585 mm is up 58 mm; width between wheel housings is up 27 mm to 1100 mm; Cargo floor length (when rear seats folded) up 290 mm to 1856 mm; (seats not unfolded) up 35 mm to 908 mm. Cargo area (VDA measurement) is up by 78 litres, to 498 litres. Inside the cabin there are interesting sharp angles on the dash area that give this Japanese SUV a real feeling of solidity and practicality. 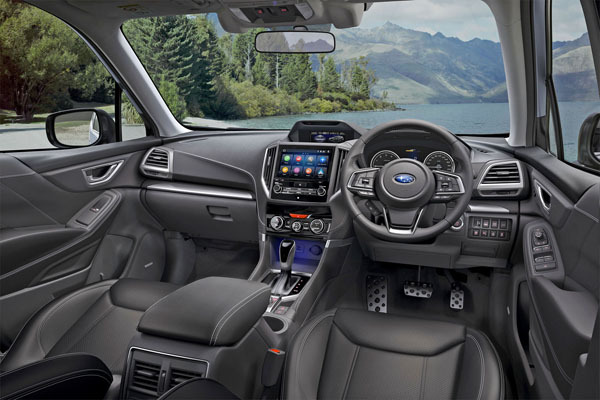 Style is, of course, very much a matter of personal taste, but we really like the new Subaru Forester theme. Digital radio (DAB+) is installed in the Forester for the first time. There’s Apple CarPlay and Google Android Auto connectivity. 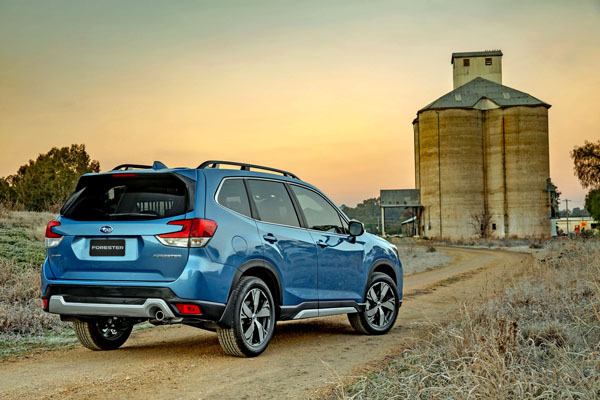 Subaru Australia anticipates a five-star occupant safety rating when new Forester is tested by the Australasian New Car Assessment Program (ANCAP) later this year. Subaru’s EyeSight driver assist system is now standard across the entire Forester range, an important feature as it’s much better to avoid a crash than to minimise injury to occupants during a collision. If the Forester thinks you’re getting sleepy or otherwise not driving correctly the Driver Recognition, Driver Monitoring System will give you a message to say pay attention. Gen-five Forester has slightly more engine performance with reduced fuel consumption and lower emissions. The 2.5-litre boxer flat-four engine now produces 136 kW of power (up 7.9 per cent) and 239 Nm of torque (+1.7 per cent). The CVT has a seven-speed manual mode to give a sportier sound and more response. Realistically, the automatic isn’t quite as good in this mode as in full CVT but, hey, it certainly sounds and feels better and isn’t that what keen drivers want? We carried out an extensive drive program of the new Subaru Forester in the Grampians area in western Victoria as part of the two-day event arranged by the importer to launch its new model. This is a gloriously green, hilly area that currently looks more like Ireland than the drought-stricken areas further north in this wild brown land that is Australia. Keen on really demonstrating the ability of the Forester off sealed roads Subaru had close to 70 per cent of the run on dirt roads. Exactly the type of conditions that would be explored by families on a weekend, or longer, venture. There’s good interior space for four adults and a child, five adults with a big of a squeeze across the back. The load area is impressively large and could easily cope with five lots of luggage. Ride comfort is pretty good and noise and vibration levels are kept to the sort of levels that normally are found only in large sedans. However, there was some light wind whistle from the lower corner of the front windows. This was possibly caused by the shape of the windscreen with is deliberately styled to give maximum outward view to the driver. Handling is very competent thanks to the all-wheel-drive system and only when really hassling the Forester at speeds did the driver assist system intervene to get things back on line again. Engine performance is good, but nothing special, a higher performance model may come later, but Subaru Australia isn’t commenting on this. The CVT auto works nicely and seldom had to resort to the pretend fixed gears – thus picking efficiency over engine sound. Subaru has been a leader in the SUV all-wheel-drive field for many years and the fifth generation Forester should certainly sit high on your short list if you want to get reasonably serious about driving away from sealed roads. Note: These prices do not include government or dealer delivery charges. Contact your local Subaru dealer for drive-away prices.